.. and Shadow Test Confidence! This paper is in the running for both the longest graphics paper title and neatest lil’ shadow rendering method in recent memory. It’s pretty cool in it’s own right but I’ve had a special affection for papers that exploit temporal coherence as of late. I’d like to implement this in the near future (wouldn’t think it would take much longer than writing two blog posts.. why do I do this again?!) to see how usable it is in practice. So.. the basic idea here is that each rasterization of the scene used for a shadow map provides a limited amount of information about occluders from the view point of the light (due to its discrete nature). This is the source of spatial aliasing (blockiness). 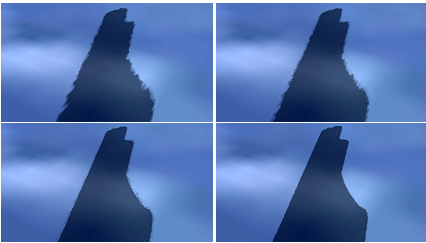 However, rasterizations of the scene over several frames provides much more information. This paper exploits this fact to generate pixel-correct shadows by “honing in” on the correct answer over many frames and relying on the human eye’s inability to adapt quickly to notice this adaptive process. This method is lightweight, simple and should fit right into an existing rendering pipeline. – The method uses a screen-space history buffer that maintains information about per-pixel visibility over the past few frames. This is similar to the reprojection cache (another awesome temporally-exploitive paper, links below). 1) Calculate current frame’s per-pixel visibility using traditional shadow mapping. 2) Transform each pixel to the history buffer by transforming the pixel’s position using the transformation matrices of the camera in the current and previous frame. 3) Update the history buffer using this frame’s visibility test results. 4) Shadow scene with updated history buffer. – The history buffer is updated with exponential smoothing according to some confidence value that describes how close the sample is to a correct visibility result. – The confidence value is calculated as the distance between a pixel’s position in shadow map space and the closest shadow map texel center. This makes sense.. a scene position that maps exactly onto a shadow map texel has a correct visibility test result. – The shadow map must contain different rasterizations of the scene over time or no new information is added to the system. This is achieved by sub-pixel jittering in both translation and rotation of the shadow camera. Daniel Scherzer, Stefan Jeschke, Michael Wimmer. Pixel-Correct Shadow Maps with Temporal Reprojection and Shadow Test Confidence. In Rendering Techniques 2007 (Proceedings Eurographics Symposium on Rendering). P. Sitthi-amorn, J. Lawrence, L. Yang, P. V. Sander, D. Nehab. An Improved Shading Cache for Modern GPUs. ACM SIGGRAPH Symposium on Graphics Hardware 2008. D. Nehab, P. V. Sander, J. Lawrence, N. Tatarchuk, J. Isidoro. Accelerating Real-Time Shading with Reverse Reprojection Caching. ACM SIGGRAPH Symposium on Graphics Hardware 2007.